EagleSpeak: If You Grow the Fleet, Who Is "Optimizing the US Navy's combat logistics force?" If You Grow the Fleet, Who Is "Optimizing the US Navy's combat logistics force?" Fuel stands first in importance of the resources of the fleet. Without ammunition, a ship may run away, hoping to fight another day but without fuel she can neither run, nor reach her station, nor remain on it, if remote, nor fight. A partial history of naval logistics in WWII can be found at Beans, Bullets, and Black Oil: The Story of Fleet Logistics Afloat in the Pacific During World War II by Rear Adm. Worrall Reed Carter. And more of the WWII story in Ships, Salvage, and Sinews of War: The Story of Fleet Logistics Afloat in Atlantic and Mediterranean Waters During World War II by Rear Admirals Worrall Reed Carter andElmer Ellsworth Duvall USN (Retired). Logistics and support activities were vital to the success of U.S. and United Nations Korean War operations. Without extensive and efficient trans-oceanic shipping, the tens of thousands of service people and the hundreds of thousands of tons of "beans, bullets and black oil" needed every month to prosecute the war would never have reached a war zone that was some five thousand miles from the U.S. west coast and about twice that far from eastern seaboard ports. 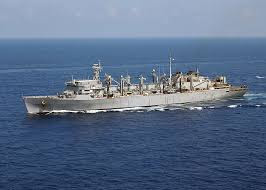 Without underway replenishment of warships off the Korean coast, the effectiveness of Naval forces there would have been substantially reduced. Without well-equipped and effectively-staffed Japanese bases close to the combat theater, sea and air operations against the Communist aggressors would have been gravely hindered, and, during the crisis periods of summer 1950 and winter 1950-51, probably impossible. Without ports and other facilities in South Korea, the insertion and sustenance of the large ground forces needed to defend that country simply could not have been done, and local naval operations would have been hamstrung. Like much else about the Korean War, its logistics and support effort depended extensively on the legacy of World War II. Transport ships, long-range aircraft and much of the other equipment used in supporting the war had been made during that great conflict and had been wisely retained against the possibility that it might be needed again. The senior officer and enlisted servicemen and civilian sailors and airmen who resurrected the logistics and support system in response to the Korean crisis, and kept it running thereafter, had largely learned their crafts in the struggle against Japan and Germany. positions of responsibility have written their own accounts of what went on during a major war. Quite understandably these have tended to focus mainly on the purely combat features of the war and on overall strategy. The result has often been an unbalanced picture of the total military effort. What about going forward? Here's a OR look at the issues as they existed in 2008. 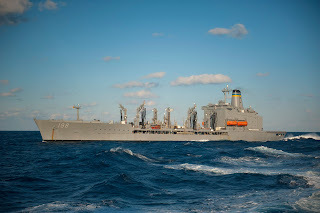 If you are wondering about the current Navy combat logistics force, it is now in the Military Sealift Command and the inventory of ships can be found here. Not to mention, there is no protection for logistics ships. Yes, Yes, a thousand times Yes. To paraphrase WSC: "Victory is the bright flower, logistics is the stem without which it would never have grown".